Mahfouz M. AbdulKader, Rashid M. Mohammad, Khan S. Mohammed, Murugan L.
Department of Anesthesiology, Al Nahda Hospital, Ministry of Health, Sultanate of Oman. *Address correspondence and reprints request to: Mahfouz M. AbdulKader, Department of Anesthesiology, Al Nahda Hospital, Ministry of Health, Sultanate of Oman. AbdulKader MM, Mohammad RM, Mohammed KS, Murugan L. Anesthetic Management of a Patient with Severe Post-tracheostomy Stenosis. Oman Med J 2013 Jan; 28(1). Anesthetic management of cases of post-tracheostomy stenosis is challenging for most of the anesthesiologists. We are describing a case of severe post-tracheostomy stenosis and its management using Hunsaker Mon-Jet laser resistant tube. Keywords: Tracheostomy; Tracheal stenosis; Laser; Insufflation anesthesia. The estimated incidence of severe post-intubation and post-tracheostomy stenosis in the general population is 4.9 cases per million per year.1 The anesthetic management of these cases is challenging for most anesthesiologists. We are presenting a case of severe post-tracheostomy stenosis, describing how its diagnosis was reached and its anesthetic management. A 38 year old female was presented to the hospital with complaints of difficulty in breathing and stridor for 2 months with exacerbation on exertion, supine position and during upper respiratory tract infection. She had no history of dysphagia. The patient was being treated at a primary health centre with bronchodilators, nebulization and antibiotics but with poor response. Hence, she was referred to a tertiary care hospital for further evaluation and investigations. Her past history revealed that she had poly-trauma following road traffic accident 1 year back. At that time, tracheostomy was performed and the patient was kept on a ventilator for a period of 2 weeks. During this period, the patient was exposed to uneventful multiple surgical interventions under general anesthesia. She was decannulated 4 months after trauma and was doing fine until 2 months back when her present complaints started. On clinical examination, the patient was found to be morbidly obese with a body weight of 99.7 kg and body mass index (BMI) of 40. Heart rate was 94/min, non invasive arterial blood pressure (NIBP) was 121/51 mmHg, respiratory rate was 25/min and oxygen saturation was 98% on room air. A well healed tracheostomy scar could be seen. Cardiovascular and neurological examinations were unremarkable. Routine laboratory investigations, chest X-ray and ECG were within normal limits. Indirect and fiberoptic laryngoscopy showed no abnormality. Barium swallow was done to rule out any anterior out-pouching of oesophagus and was reported normal. 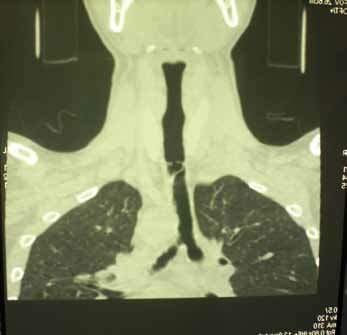 CT scan revealed an irregular and narrowed short segment of the trachea at the level of the suprasternal notch. A shelf/ web like protrusion was seen from the posterior and lateral wall of the trachea with two lumens (Fig. 1). Fiberoptic airway assessment by a flexible bronchoscope size 2.7 mm was done under monitored anesthetic care after spraying the airway with lignocaine 10% to confirm the diagnosis. The examination showed normal glottic and sub-glottic area. Vocal cord movements were normal. At the level of the mid-trachea, a thick band of tissue extending from the posterior to the anterior wall was seen that divided the tracheal lumen into two small openings and fiberoscope could be negotiated through one of them. Below the level of web, the tracheal lumen was patent down to carina. Once the findings were confirmed, it was decided to ablate the web with laser. Figure 1: CT scan showing near total tracheal obstruction at the level of the suprasternal notch. The patient was pre oxygenated with 100% oxygen followed by inhalational induction with sevoflurane 8%. Remifentanil infusion was started at a dose of 0.05 ug.kg-1.min-1. After adequate depth of anaesthesia was achieved, Macintosh laryngoscope was used to insert a Hunsaker Mon-Jet ventilation tube. With the guidance of fiberoptic bronchoscope, the tip of the Hunsaker tube was directed through one of the lumen of the web towards carina. The patient was kept on spontaneous breathing with insufflation of anesthetic gases through Hunsaker tube. The patient was actually inspiring and expiring most of the tidal volume around the Hunsaker tube. Maintenance was with sevoflurane 3-5% in 35% oxygen and air with continuous infusion of remifentanil at the same dose. End tidal CO2 and airway pressure were monitored through a side port of the Hunsaker tube in addition to monitoring of ECG, NIBP, pulse oximetry and respiratory rate. Manual jet ventilation was not used in anticipation of significant obstruction to expiratory flow and risk of baro-trauma. Diode laser was used safely and successfully to ablate the web as Hunsaker tube is laser resistant. Surgical procedure including ablation of stenotic band, application of Mitomycin to raw tracheal mucosa after the removal of debris to prevent fibrosis and re-stenosis, and tracheal dilatation lasted for 35 minutes. The patient was hemodynamically stable all through the procedure with no episodes of hypoventilation or apnea. At the end of the procedure, the Hunsaker tube was removed. Oropharyngeal airway was inserted and 100% oxygen with mask was given and recovery was smooth. The patient was kept in ICU for close observation and discharged to the ward the next day in good condition. There is no ideal anesthetic technique for management of cases of post-tracheostomy stenosis. The choice of anesthetic technique will depend on site and severity of stenosis, the use of laser and surgical requirements.2 In the presented case, the stenosis was severe and at the level of mid trachea. The problem was how to maintain an adequate airway and ensure optimal oxygenation and CO2 removal during the procedure. The intended use of laser added another problem. Selection of anesthetic technique was a great challenge for the anesthesiologists. The use of a cuffed laser tube should provide a good control of the airway, reduce the risk of fire with the use of laser and prevents aspiration, but due to interference with surgical view and narrow lumen of the tracheal stenosis, the laser tube was not used. Jet ventilation through Hunsaker tube was another alternative, but the risk of barotrauma from obstructed expiratory gas flow made the use of manual jet ventilation unjustified. The ideal technique in this obese patient would have been high frequency jet ventilation (HFJV) due to continuous expiratory gas flow of air, enhancing the removal of blood and debris from the airway, reducing peak airway pressure and risk of baro-trauma, hemodynamic stability and efficient ventilation compared with other anesthetic techniques.3 Unfortunately, it requires a special ventilator which was not available at the hospital. There is versatility in the types of post-tracheostomy stenosis presentation and hence in its management techniques. Safe anesthetic management depends on the patient's general condition, the presentation of lesion, urgency of treatment, expertise and resources availability, and finally surgical requirements. Administration of insufflation anesthesia through Hunsaker Laser resistant tube with a small external diameter was effective in the management of severe post-tracheostomy stenosis. The surgical view was not obscured while the risk of laser induced fire was avoided and spontaneous ventilation was maintained. 1. Nouraei SA, Ma E, Patel A, Howard DJ, Sandhu GS. Estimating the population incidence of adult post-intubation laryngotracheal stenosis. Clin Otolaryngol 2007 Oct;32(5):411-412. 2. Zias N, Chroneou A, Tabba MK, Gonzalez AV, Gray AW, Lamb CR, et al. Post tracheostomy and post intubation tracheal stenosis: report of 31 cases and review of the literature. BMC Pulm Med 2008;8:18. 3. MacIntyre NR. High-frequency jet ventilation. Respir Care Clin N Am 2001 Dec;7(4):599-610. 4. Brooker CR, Hunsaker DH, Zimmerman AA. A new anesthetic system for microlaryngeal surgery. Otolaryngol Head Neck Surg 1998 Jan;118(1):55-60. 5. Orloff LA, Parhizkar N, Ortiz E. The Hunsaker Mon-Jet ventilation tube for microlaryngeal surgery: optimal laryngeal exposure. Ear Nose Throat J 2002 Jun;81(6):390-394. 6. Young-Beyer P, Wilson RS. Anesthetic management for tracheal resection and reconstruction. J Cardiothorac Anesth 1988 Dec;2(6):821-835.